The Family Grows Again: Rudolph! The Santa Claus family was increased by one in the years before World War II. 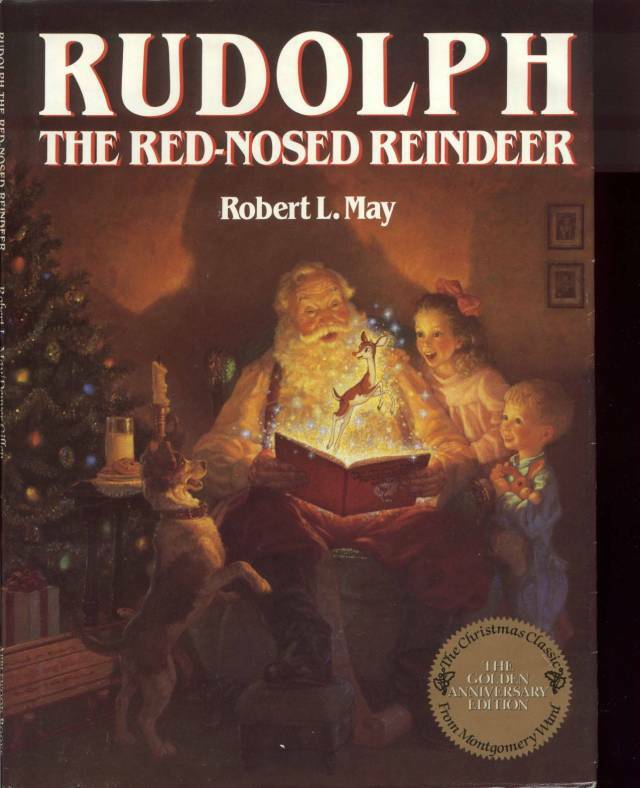 Rudolph, the ninth reindeer, with a red and shiny nose, was invented in 1939 by Robert L. May, an advertising writer for the Montgomery Ward Company. May’s boss wanted to give away a special book to children during the Christmas season. In January 1939 May started to work. Although the boss first rejected the story of Rudolph, May persisted. May completed it in late August, Denver Gillen illustrated it, Montgomery Ward printed it, and 2,500,000 copies were distributed that Christmas. When Wards reissued the book in 1946, more than 3,500,000 copies were distributed. That same year, Sewell Avery, chairman of Montgomery Ward, gave the copyright to Bob May. The next year, a children’s book publisher brought out a new edition, and sold over 100,000 in two years. In 1949, Johnny Marks wrote the song about Rudolph. Gene Autry recorded it; it went to #1 on the Hit Parade and sold 2,000,000 copies. The film version first aired in 1964, and the story and song have been translated into over 25 languages. In 1989, Wards reissued a Golden Anniversary Edition, a facsimile of the original 1939 edition, published by Applewood Books (see above). Robert May graduated Phi Beta Kappa from Dartmouth College in 1926 and joined Montgomery Ward in 1936. A humble, soft-spoken man, he was gratified that children had so responded to his little story. May referred to Rudolph as ‘my generous son,’ claiming that the reindeer enabled him to send his six children to college. In 1958 May donated the original manuscript to the Baker Library at Dartmouth College, which now houses the Robert L. May Collection. May left Wards in 1951 to manage Rudolph’s career, but returned to the company in 1958.He retired in 1970 and died in 1976. Montgomery Ward went out of business in early 2001. Because the poem is still under copyright it is not reproduced here. Reproductions of the 1939 original are available from used-book sellers on the World Wide Web. Of course, Robert May's depiction of a reindeer was not the first. In 1821, a small, sixteen-page booklet appeared, titled A New Year’s Present for the Little Ones from Five to Twelve, Part III. It was about Christmas, and was the first to picture Santa Claus in a sleigh drawn by a reindeer. This postcard (at right) was mailed in 1909. The Urban Legends Reference Page, by Barbara and David P. Midelson, has a good article on the background concerning the creation of this story, which I recommend. You can ready Mr. Frankel's article on his web site: Rudolph that Amazing Reindeer (The article is about half-way down the page). On the topic of flying reindeer, generally, one person to talk to is Portland, Oregon Zoo Director Tony Vecchio, who is compiling scientific data for his research on reindeer flight. His website, World Reindeer Sightings, contains tips on sighting reindeer, a world map to see where other reindeer have already been sighted, a press release, and a video interview with Mr. Vecchio. There is also an email address for reporting sightings! The poem by Robert May became a song in 1949 by John Marks, one of the most prolific and popular modern composers of Christmas songs. Because the song is still under copyright, it is not reproduced here. The story about the song is best told by Professor (Emeritus) William Studwell. "Rudolph is a cute and loveable character," he said. "People like him because he was the ‘under-reindeer’—the lowest on the pecking order. But he overcame that to become a superhero of Christmas." "Rudolph’s brightly-lit nose and heroic stance have brought him to the forefront of Christmas novelties. An explosion of Christmas merchandise hit the markets after Rudolph hit the airwaves," Studwell said. "Rudolph’s fame also sparked the trend for the creation of other holiday characters, such as Frosty the Snowman and the Grinch. Even the schoolyard parodies of the song indicate that Rudolph has indeed "arrived" in everyday culture," Studwell said. See also: William E. Studwell and Dorothy E. Jones, Publishing Glad Tidings: Essays on Christmas Music (New York: Haworth Press, 1998). Professor Studwell also provided assistance in preparing the text notes to the Millennia Collection of Christmas carols. This article was posted on the NIU web site. Professor William Studwell retired from Northern Illinois University, and passed away in 2010. See: William Emmett Studwell.